Avionics/Wiring: Panel lit up and wiring tested. I inquired about having the wiring professionally done and was quoted $3k-$5k. I deemed that entire range too expensive, so I opted to complete the wiring myself. Purchased tools were: Wire strippers, crimper and insertion/extraction tool. Rather than make a classic wiring diagram, which I find difficult to read and remarkably unintuitive, I instead created in PowerPoint something I'll call a "wiring map" for each connector on each instrument. 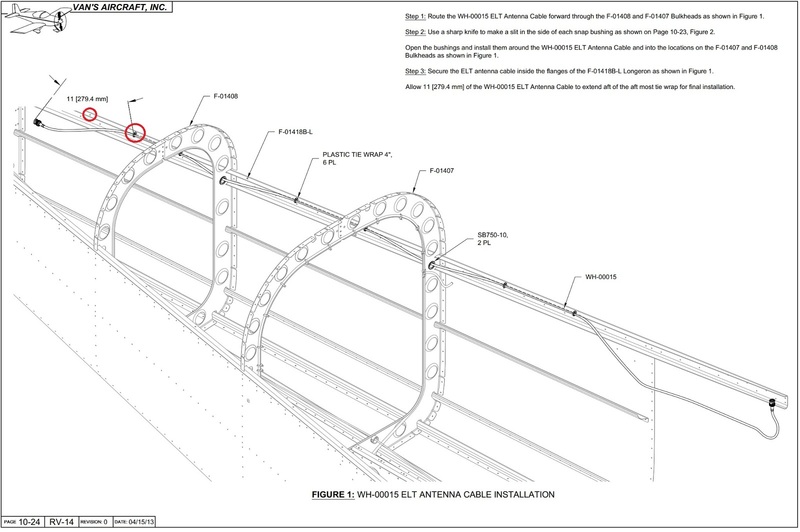 The objective was to track where each wire went to, make it visually appealing and very easy to read, especially when consulting the map to direct the fabrication of the harnesses. 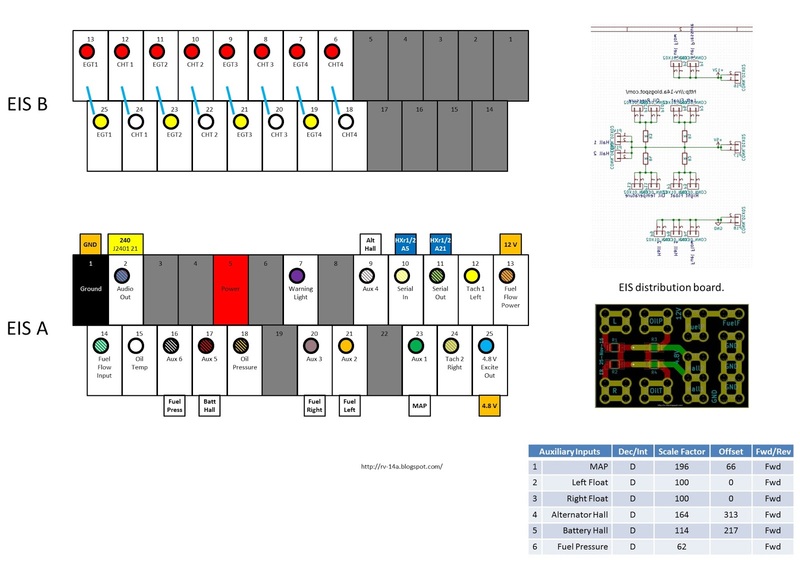 Examples of these "wiring maps" are shown below. 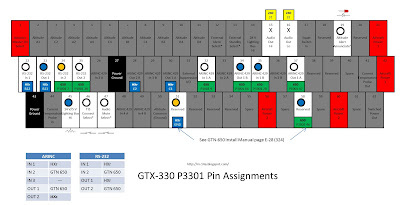 Unused pins are greyed-out. Colored rectangles for each position represent the instrument and its associated pin that each wire goes to. Circles represent the wire color used ("x" denotes the wire is placed, but the color is not recorded). 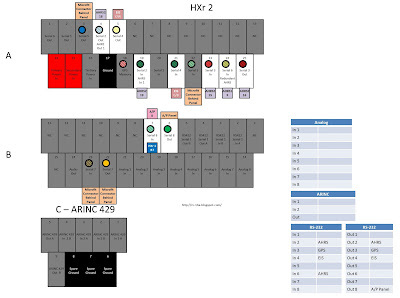 ARINC, RS-232, audio and input/output allotments are recorded in tables. GMA 240 replaced with a GMA 245 on 12-Aug-18. As an example of the wiring: Left shows the GTN-650 P1001 harness. 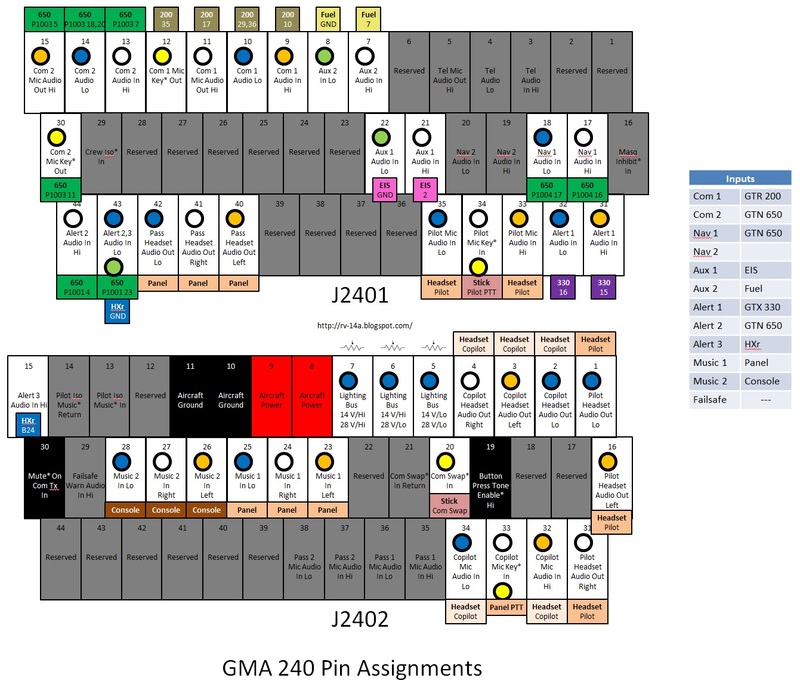 Right shows the populated pins for the GTN-650. For each wire's label, rather than buy an expensive heatshrink printer, I obtained various sizes of clear heatshrink (3/32", 1/8", 3/16", 1/4") and printed the wire function and pin number on slips of paper in 6 point font. A label was created for both ends of the wire (e.g., "7 RS-232 Out 2" on one side, "24 RS-232 In 2" on the other). 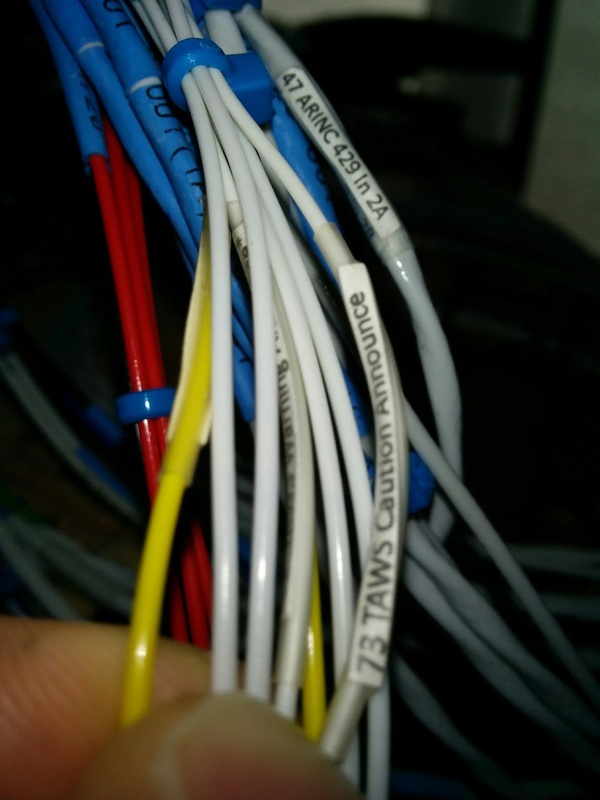 A piece of heatshrink was slid onto the wire, with the label slipped beneath the heatshrink. A quick application of heat from my heat gun sealed the deal (literally). The credit for this approach goes to someone else and I happily stole it. Some Garmin wires were pre-labeled and when appropriate, I used those and then discarded/re-purposed the others. Below shows the GTX-330ES harness with a few labels visible. Here is what the spaghetti looked like when it was first connected on the "bench" (a.k.a., my kitchen table). Powered up! 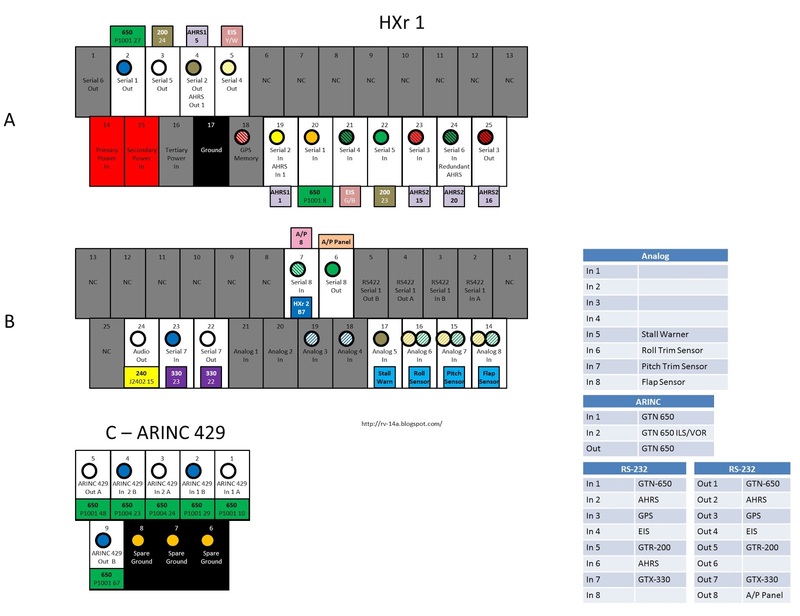 After meticulously testing all inputs and outputs (via headset and multimeter) then configuring all devices' RS-232 and ARINC ports and verifying communications between units, it was confirmed that my wiring is correct. Amazingly, no fixes were necessary. 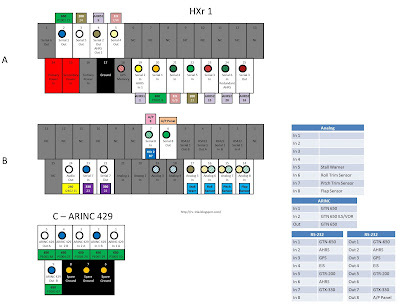 The right EFIS is not shown in the picture below. 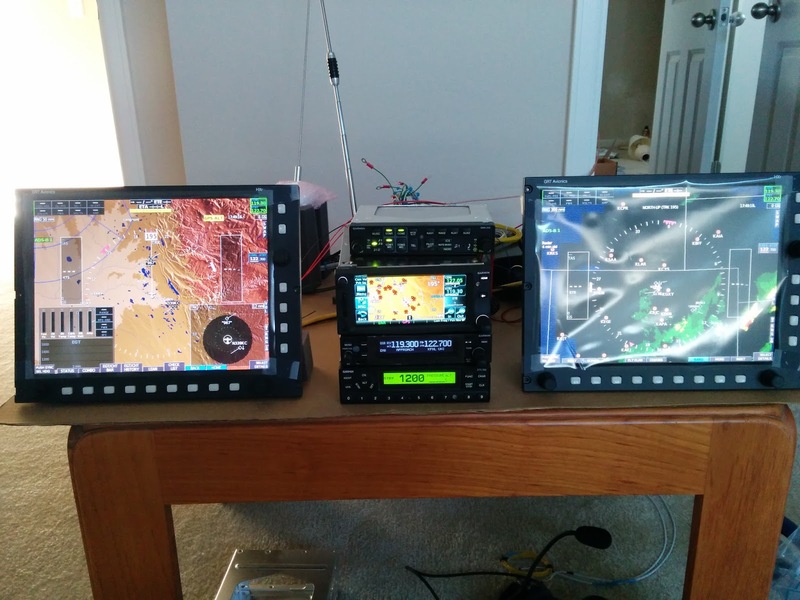 Update 5-Apr-16: I had to reclaim the space taken for the radio shop (a.k.a., the kitchen table) yet still wanted to play with my toys, so I setup the panel in a different room, connected antennas and the right EFIS. Now I can play pilot, listening to and seeing traffic and watching weather. FWF: Firewall forward kit received. Total cost, shipped, was $7,097.02. It came via FedEx in three cardboard boxes. Unfortunately, despite the larger house which I bought for my airplane (as the previous digs eventually found itself unaccommodating of the build), I'm finding space at a premium once more. So I have laid out the parts in my mostly empty living room, where the propeller and wings are also in residence. The gear leg fairings, canopy frame and aileron pushrods not withstanding, the parts are comprised of the engine baffling, spinner, battery, air filter, exhaust tubes, wires, Lord mounts, etc. Avionics: Garmin center stack trays fitted and EIS located. 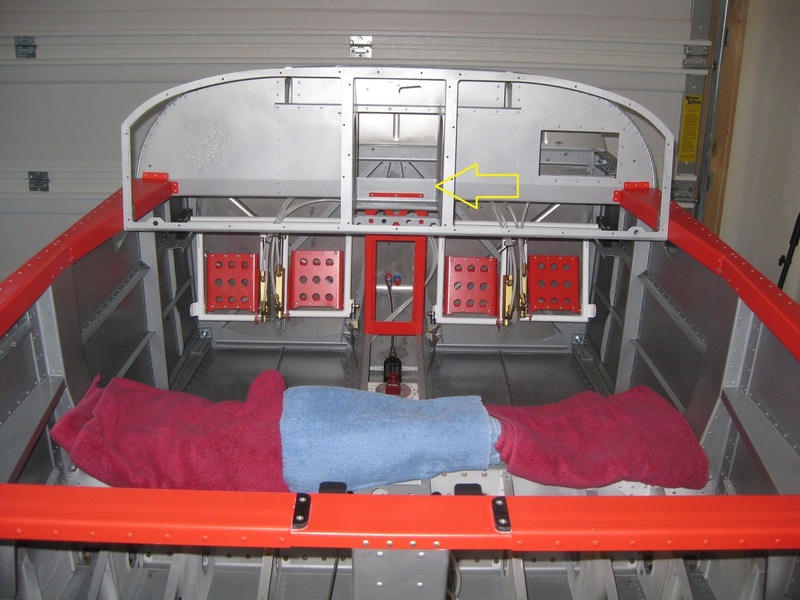 The F-01455 Sub Panel sits a little more than an inch above the F-140106 Wiring Channel, as shown below by the yellow arrow. The depth of nearly all of my Garmin center stack trays (the intercom being the exception) projects into this area. So to accommodate the stack, I had to remove with a Dremel about an inch of the Sub Panel in that area. However, even with the removal of that piece, the center stack still sits higher than I had originally planned, so I had to redo my panel design to accommodate this eventuality: The backup airspeed, altimeter (the upper right mounting hole of which will be unused, as it overlaps the F-01467 Instrument Panel Frame) and fuel gauges were moved to the right, whilst the ELT, Hobbs, AE Fuel Guardian and the defrost and avionics fan switches were moved to the center. My RV-9A builder-friend match drilled the trays into position with a pneumatic angle drill. A small slot had to be cut into each side of the F-01456-L/R Fwd Fuse Ribs to accommodate the wiring harness of the GTR-200. Not shown is some 1/8" aluminum angle that was match drilled into the Fwd Fuse Ribs for additional rigidity. I'm considering attaching the aft angles to the F-01467 Instrument Panel Frame too. The EIS was located in the Sub Panel by cutting a rectangle out with a Dremel. Because the EFIS provides both the same and elaborated information, there is no need to see this instrument (though, in testing my wiring, it's apparent that the EFISs take some 30 seconds to boot, so one could argue that the EIS is still useful in a visible location). The EIS will live here under the canopy, as shown in its matched-drilled location. Nutplates were added so the EIS can be removed without reaching behind the subpanel. Update 2-Apr-16: I later used four pieces of 1/16" aluminum angle, 2 on each side, to reinforce where the trays screwed in to the ribs. The images below were taken on 1-Oct-16, after the panel was wired and installed. The left image shows a piece of angle riveted to the F-01467 Instrument Panel Frame (this view is from forward of the panel looking aft). Notice that the angle has notches cutout in it to accommodate 2 of the 3 nutplates. The other nutplate was removed from the frame and instead attached to the angle. Furthermore, of the four screws anchoring the trays, the washers on the two middle screws were reshaped by grinding on the ScotchBrite wheel. The right image shows a piece of angle with only two screws from the trays passing through it. This angle is not riveted to the airframe however it distributes the clamping force from the nuts over a larger area on the F-01456-L Forward Fuse Rib. Antennas: Garmin GTN-650 GPS antenna mounted. 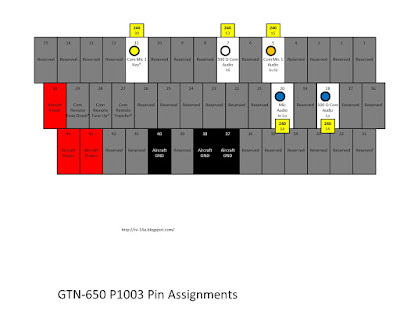 The Garmin GTN-650 GPS/Nav/Comm uses the Garmin GA-35 GPS/WAAS antenna. This antenna must be located on the airframe. 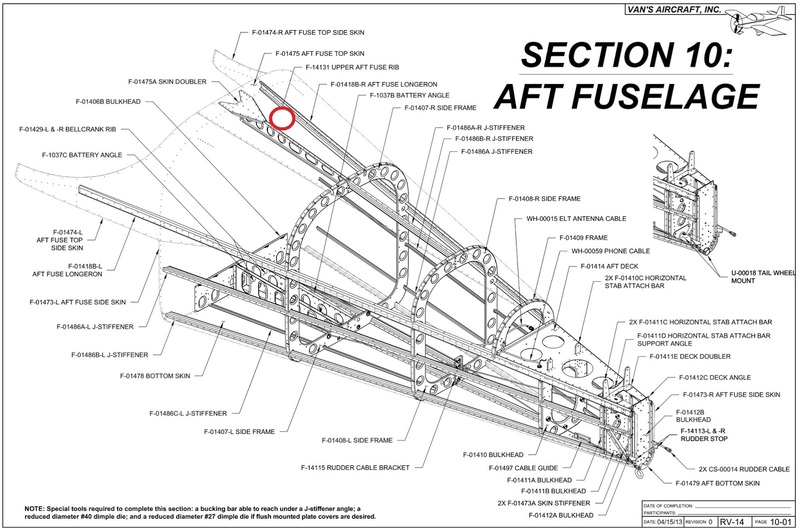 I opted to place it behind the F-14126 Window and on the right of the F-01475 Aft Fuse Top Skin to clear the F-14131 Upper Aft Fuse Rib and F-01475A Skin Doubler, as shown with the red circle from page 10-1. First a doubler needed to be fabricated. The doubler template can be found here. I used aluminum from an RV-9 capacitive fuel plate I had as scrap. A hole is drilled into the Aft Fuse Top Skin (and let me tell you, that was psychologically hard to do). The antenna is then located, centered and temporarily affixed. 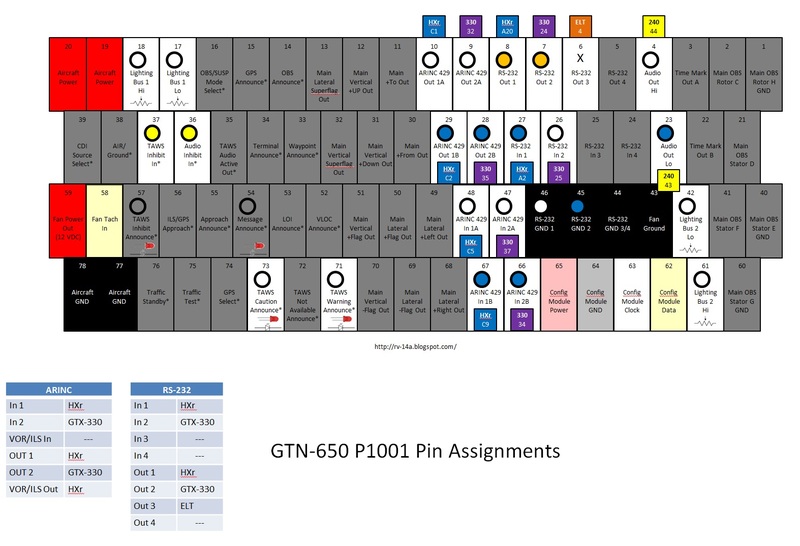 I happened to have a spare, "previously-flown" GA-35 I used for this purpose, so as not to mar my new one. The four screw holes are then carefully matched drilled into the Aft Fuse Top Skin. The antenna can then live happily in its new home. When I permanently attach mine, it will need to include antenna sealant. Go here to see how this was finally installed on 18-Nov-16. Avionics: Magnetometer bracket fabricated and installed. The GRT magnetometer must be mounted with a significant distance from objects that can disturb the ambient magnetic field. 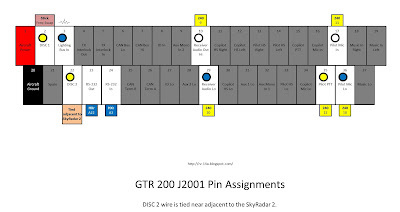 GRT recommends placing the magnetometer in the wingtip. I prefered to keep it in the fuselage as it would make future mounting of the AHRS easier. 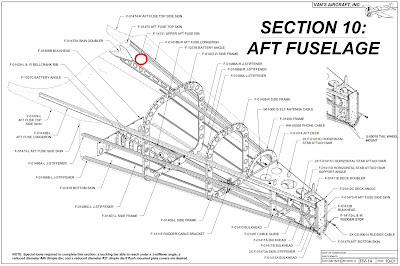 The location I chose was in the aft fuselage, just forward of the ELT. It turns out that the F-01418B-L/R Aft Fuse Longerons have holes drilled in their upper flanges to accommodate wire ties. 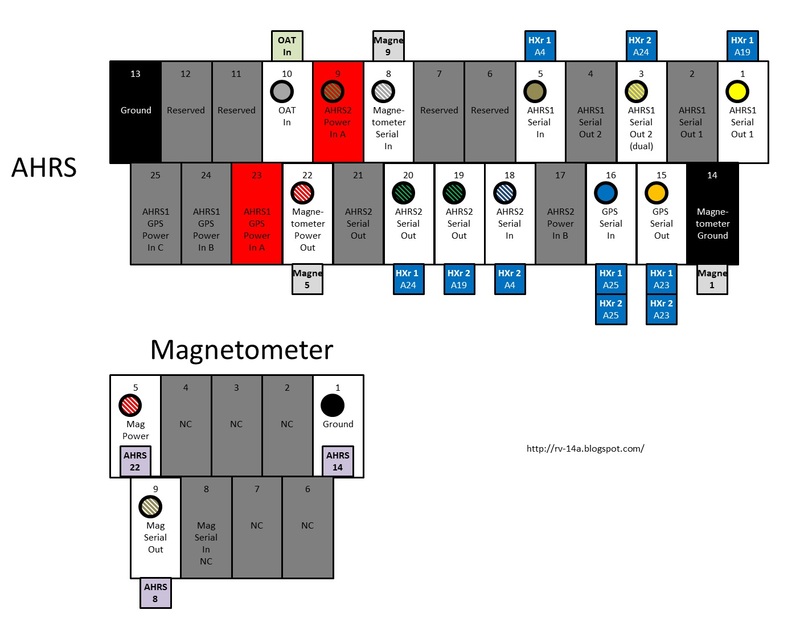 I found that I could those holes to mount a tray to support the magnetometer. 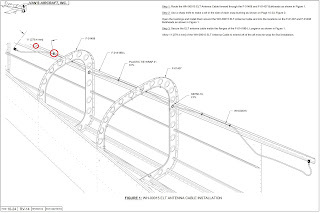 I used the two holes on each longeron circled in red. For the tray and mount, there was no need to purchase additional aluminum. The cross-members were fabricated from the C-01442B Mid Canopy Fixture, that was used to temporarily affix the canopy frame. The tray was fabricated from some RV-9 capacitive fuel plates I had laying around. To locate the holes properly to the Aft Fuse Longerons, rather than risk match-drilling into the latter, I simply cut the cross member to length, then rested them on the Aft Fuse Longerons over the holes. I push grease up into the holes, which then remained on the cross members. This allowed the holes to be drilled into the cross-members without bringing a drill near the Aft Fuse Longerons. Below is the top (left) and bottom (right) of the fabricated mount. The mount with magnetometer as viewed from the turtle deck. It is attached to the Aft Fuse Longerons with four LP4-3 rivets. The magnetometer is secured to the tray with nylon screws and nuts with a dab of Loctite. The mount with magnetometer as viewed from the baggage area.